Looking to make your own deck shade sails? When you own a deck it’s a great place to entertain but any sun you get on the deck can get quite hot, which makes it too uncomfortable to entertain. A good deck shade sail can keep your deck quite cool and give you a comfortable place to sit and have fun with friends. These shades can be quite expensive to buy but thankfully there are ways you can make them on your own. If you are looking to make your own deck shade sails I recommended the DIY (Do It Yourself) Shade Sail book. In this book, you’ll learn the techniques required to make your own deck shade sail from an expert. For over a decade the writer of the book has been manufacturing, designing and installing high quality sail style cloths for decks to keep the sun off. His techniques are combined in an easy to follow book that anyone can use to make their own professional looking shade sail. You can have the covering you have always wanted for your deck that looks great and makes it much cooler for those hot days when you wan to stay on your deck and entertain your friends. The book contains step by step instructions so you can make your very own shade sail and save hundreds of dollars. The handbook is done in a way that anyone will be able to use it, regardless of their experience. In the beginning you’ll learn all about shade sails and how they protect you from UV radiations form the sun. You’ll get facts and why you should install a shade sail. In the next section you’ll learn how to plan for your shade sail. You find out of you need permission for your plan, how to dig the holes, install your columns plus a lot more. The next section will describe shade sail design. You’ll learn how to order a shade sail and more. You’ll learn how to put the poles in the holes and more about the structural design details. You’ll learn about the hardware you need for your shade sail and how to fit the shade sail so it’s installed in the correct manner. You’ll get a step by step guide for the installation process. The book covers everything that you’re going to need to install and use your own shade sail at home. These shade sails are great for protecting you and your family from harmful UV rays and for making your deck or other outside area a comfortable place to be. People who have read the book say it has helped them install their own shade sail at home. The book also shows you how to install the shade sail so you get the s shade where you want it the most. The book shows you how to plan where the shade sail will go too. DIY (Do It Yourself) Shade Sail book is recommended. 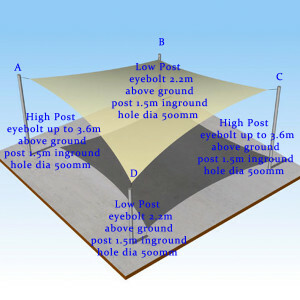 Looking for information on shade sails DIY or shade sails do it yourself? A good shade sail can make a great addition to your outdoor deck or other area where you entertain. You can buy these yourself if you want to or you can do this project on your own. Here’s a few things you need to know about shade sails. 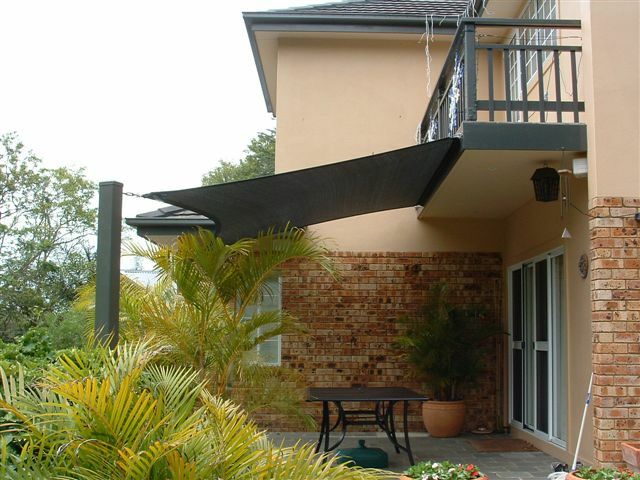 A shade sail will provide you with ample shade for your outdoor are. This will keep it cooler but also allow you a lot of protection form the sun’s harmful UV rays. You will have to decide where you want be shade sail be so it to maximizes the potential of the sail to provide you with the best protection from the sun. It can be difficult to understand exactly where to put your sun shade or even how to start the process. There’s a book called DIY Shade that will help you understand shade sails. How Can DIY Shade Help Me? These shade sails are one of the best way to provide you with a good amount of shade and UV protection when you are outside entertaining or just want to enjoy a meal outside without having to worry about the heat. The book is a step by step guide that will teach you everything you need to know about shade sails and how to install one outside. You’ll learn all the basics and get helpful tips form an expert that has been working with shade sails for as number of years and has even designed these shade sails. The book explains things so well that you’ll be shade sail expert by the time you’re done. If you have wanted to install a shade sail this book takes you through step by step using a simple process you can understand. If you want a cool area outside for entertaining then this book is for you. Installing the shade sail won’t cost you a lot of money. If you want a nice looking shade that people will talk about then this book is for you. If you talked to a professional company you know how much shade sails can cost. By installing it yourself you’ll save a ton of money and have a great shade sail once you’re done. This book is a comprehensive guide to learn everything about shade sails. This is your installation bible and you’re going to have a great shade sail in your yard once you have read this book. There’s a lot of helpful charts in this book that break down the installation process so you don’t make mistakes during the installation procedure. This book is low cost but provides you with a ton of information about shade sails. This is the only guide you’ll ever need to having a great shade sail in your backyard. If you have always wanted a shade sail then the Shade sails DIY book is the right choice for you. Have a look at this shade sail. It’s a problem that we see often. The shadesail is sagging badly in the centre and this particular sail has gotten to the point that it has sagged so badly that the centre is rubbing on the top of the play equipment and this has caused it to wear a hole in middle. The cause of the problem is simple – the solution is more difficult. 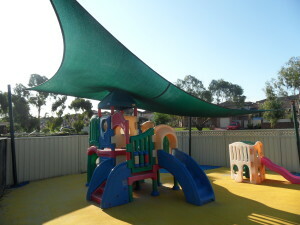 The reason this shade sail is sagging is because the posts which support it have been underspecified – that is, they are much to light to support a sail of this size. To make matters even worse, at least one of the posts has actually moved. The cause of a post moving in the ground is that it wasn’t put in deep enough. Over time, with the wind and tensions on the sail, the footing of the pole has moved in the ground causing the post to slope inwards and the sail to sag. 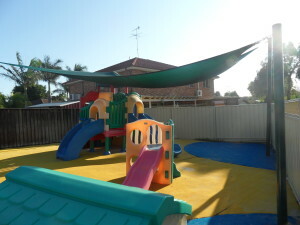 We were contacted by the proprietor of this childcare centre wanting us to manufacture him a new sail – not a problem! The issues however come into play when it comes time to tension the new shade sail. It is possible to “beef-up” the undersized footing on the post that has moved but it isn’t so easy to stiffen up the columns to support a new shadesail. Basically, as soon as we go to apply any real tension on the new shadesail, the columns, because they are much to light to support a sail of this size will begin to flex inwards. The more we tighten the sail, the more the columns will bend making it nearly impossible to get the sail tight. This is a problem that should not have happened and could have easily been avoided. It is so important to use the correct size posts and footings when installing a shadesail. It may have seemed like an easy option at the time to use cheaper posts and it was probably a hot day when the installers dug the holes for the posts and they thought, “ahhh, this should be deep enough, who will ever know”. Well now the whole thing has come back to bite. I can’t emphasis it enough to you the DIY shade sail installer – Do not short cut on the size and specification of your columns. Do not think near enough is good enough when it comes to digging a decent footing. If you do, you’ll most likely end up with something like this and there’s nothing worse than a sagging shade sail! Probably the most common design for shade sails in the industry is the standard “Hypar” Design. Hypar is short for hyperbolic parabola. This basically means twisting the sail to create a 3D effect. Typically when people look at a hypar shadesail for the first time they often mistakenly think that it is two triangles when in fact it is a single piece of fabric tensioned in such a way as to create this interesting architectural effect. The hypar effect is created simply by installing diagonally opposed high and low attachment points. This then creates the 3D twist effect in the sail. Installing a hypar design shadesail starts by working out the two low points. Usually the low points of the sail are 2.2 metres above ground. Where ever possible look to install at least one of the low points in the direction you want the shade to cast. For instance, if you want shade later in the afternoon then consider fitting one of the low points toward the west. That way you create a lower edge to the sail limiting the amount of sun which can cut in under it and maximising your usable shade. There’s a simple formula for working out the twist in the sail. Let’s say you want to create a relatively gentle twist in your sail, nothing to dramatic. To do this you work measure the longest side of the sail and then times it by 15%. For example, lets say the longest edge to your shade sail was 6 metres. 15% of 6m = 900mm. If your low points of attachment were 2.2 metres then you’d want the high points of attachment to be 3.1 metres above ground (i.e: 2.2 + .9 = 3.1). If you want to create more dramatic effect, then increase the percentage of variance, say up to 20%. Hypar shade sails are an industry standard because they work. They give good amounts of usable shade, they look great and they tension up easily. They don’t need to be limited to 4 points of attachment but can be 6, 8 or more. I’d say if your thinking about installing a shade sail then you should be thinking about how a hypar design can work for you. and the UV Rating of the fabric they intend to use. 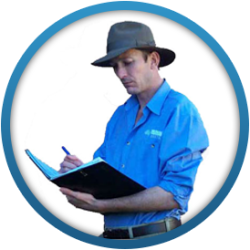 Over the years we have experimented with lots of different fabrics and most have performed well however, we’ve tended to stick with a Commercial 95 which is made by the Australian company Gale Pacific. C95 has in recent years been rebranded as “Synthesis Commercial 95″. What we like about it most is that it give very high UV block – up to 98% and has a low stretch properties making it ideal for medium-sized tension applications. 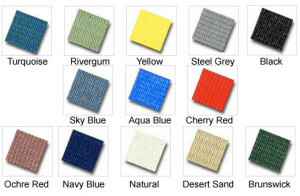 It comes in a wide range of colours and like all commercial shade cloths today, has a 10 Yr pro rata warranty against UV degradation. One thing about C95 is that it is a tape /monofilament cloth which means that it is knitted with monofilament (which is similar to fishing line) and to get the UV block, take is knitted into the fabric. Some people believe that tape shade cloths should not be put under tension and to a degree this is true. The reason is that the tape can stretch causing the sail to sag over time. C95 however retains its anti stretch properties through its monofiliment construction. There are other fabrics on the market which stretch more and aren’t suited to tension applications. Typically these are referred to as ‘domestic’ shade cloths. One thing that is important to mention here is that there are some shade cloths on the market which are 100% monofiliment – that is, they have no tape filler, all the shade is created by knitting the monofiliment. What I have seen over the years is that although this style of fabric is incredibly strong and well suited to large shade sail applications such as covering car parks, it lacks UV block and having sat underneath shade cloth with only a 90% UV block on hot days, you get the feeling that something is lacking. In summary, when selecting the shade cloth to have your sail made from, it will serve you well to be educated. In the book DIY Shade, I list most of the major brands of shade cloth and their various UV ratings and other important characteristics. Being educated on this subject can really make a difference between getting a sail that keeps you and the family cool and UV safe on hot days and not. I was travelling recently and my hotel room looked down on these shade sails in the playground of a local school. I thought there were few interesting design features with these sails that we could look at and learn from. Overall the sails have been well designed and thought-out to get the best coverage for the area. This photo was taken in the middle of the day and it’s clear that the shade is falling right beneath the sails giving really good coverage. I like the way the shade sail on the left has been curved around the corner of the building so as to continue shading up the side. To do that the installer would have needed to pattern up the sails in a CAD program (Computer Aided Design) in order that the curve cleared the edge of the building. If I had been designing these sails I would have acquired some accurate plans of the area (or if not drawn them up to scale myself) and then marked on them where the columns were to be installed. From that the computer could model and pattern up the sail. It’s interesting to look down and see the hem lines in the fabric from above. The big shadesail on the right has been made from 5 strips of shade-cloth sewn together. I’m often asked about shade sails and how many hems a certain sail will have. Most of the sails we make are made from ‘Commercial 95′ shadecloth which comes on a 3 metre wide roll so it’s relatively easy to work this out. Another interesting design feature of these sails is the mid-point join that has been put in along the hemline. The reason this has been done is to minimise the gap between the sails. Imagine if there was no join at this point, then both the sails would curve away from each other and at the mid-point the gap between them would be as much as a couple of metres. By adding this mid-point joint, this gap has been significantly minimised. A Note about mid-point joins is that unless they are done correctly, it does create a common failure point. On big sails like these, the reinforcing where the connections are need to be very strong otherwise the stitching can pull away in windy conditions. A final point that’s interesting to note with these particular shade sails is that most of the corners are directly attached to the columns – there are no turnbuckles or lengths of chain. This is the domain of very experienced shade sail installers. The tension is acquired for these sails via the internal sliding cable. The shade sails are fitted loosely and then the tension is bought into effect by shortening the cable. This of course goes a long way to gaining maximum coverage of the sails by not having a ‘take-off’ at each corner but, it doesn’t leave any room for error and if the sail is even a little to big, there is nowhere to go and no way to get it tight. Essentially what I’m saying here is that for the DIY’er, I’d recommend sticking with a turnbuckle or some some chain at each corner. This give more room for adjustment, it makes the sails a lot easier to fit and, it also give room in the future to re-tension should the sails begin to sag over time.